Peach State Roofing’s Rock Hill, SC office recently completed a commercial re-roofing project on the Rock Hill Medical Park in South Carolina. This was a project that had been in the works for about 3 years with Peach State Roofing as the building owner whom is local to Rock Hill had been budgeting for this re-roofing project over this amount of time. The buildings roof surface was approximately 30,000 square feet in size and was an existing black EPDM membrane roof which was mechanically fastened to the metal decking of the structure. One small section was held down by ballasted river rock. Peach State Roofing first came in and vacuum removed the ballast river rock off of the one section and for the remainder of the roof, PSR elected with the owner to do a recovery system over the existing EPDM. The field sheets of membrane were sliced to meet the manufacturer’s requirements and then a 1/2″ cover board was installed over the existing EPDM. The new cover board selected was mechanically attached to the metal decking to meet the manufacturer’s requirements for installation. After the surface of the existing roof was recovered over with the new cover board, Carlisle 60 mil white TPO membrane was the commercial roof membrane of choice installed. PSR used 8’x100′ membrane sheets fastened at 12″ o.c. to meet the specified requirements. The field sheets were mechanically fastened to the metal deck at this rate with 2 layers of half sheets installed around the entire perimeter. Fully adhered membrane was installed up and over all parapet walls to fully encapsulate the walls so that the building owner would not experience any wall issues for future leaks. Once the membrane was fully adhered up and over the parapet walls, new 24 gauge Kynar prefinished metal coping systems were installed on the entire perimeter of the building to give it a completed finish to meet the owners expectations and Carlisle’s roof system requirements. Some specific details completed over the course of the project were removing some of the skylights on the building which had been major leak sources for the owner and also were not in use anymore. PSR also primed and painted all of the existing drain parts to give it a new restored finish and installed all new drain bolts and washers at all existing drain locations. New wood blocking supports were installed at all of the gas lines on the roof and new Carlisle TPO membrane walk pad was installed at all roof access points. Perhaps the most challenging part of the re-roofing project was working with the building owner and the tenants to accommodate the fact that the building is an operating medical facility which completes minor medical surgeries, hearing tests, and other medical procedures. For this reason, sound was an issue which Peach State Roofing monitored closely and performed it’s work schedule around the tenants needs. Generators were also placed on extra padding to help eliminate and reduce noise and vibrations on the roof. The project took approx. 3 weeks to plan, stage, load and complete with the new Carlisle TPO membrane roof system and overall the project was a great success for PSR and the building owner. 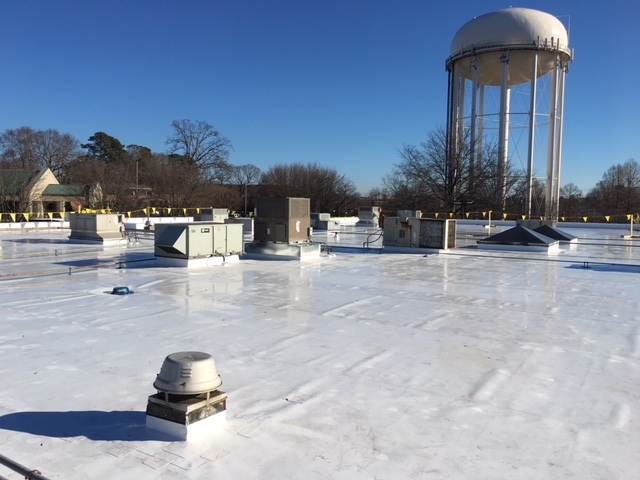 The system received a 20 year “No Dollar Limit” labor and material warranty from Carlisle and will serve the Rock Hill Medical Park as a great roof system of choice.